Oh, Lord, I thought. We have to pray. How bad is this coach driver? As he continued, I laughed softly realizing he was helping us check for personal items left behind. Ronan repeated this ritual each time we left a hotel. Wise tour guide. We arrived at the Melbourne airport in preparation for a 2½ hour flight to Alice Springs. Australia has such remote areas that traveling from one populated area or tourist destination to another is accomplished by airplane, long coach rides, or train rides. Our first tour in Alice Springs was to the impressive Royal Flying Doctor Service (RFDS), one of the most comprehensive aeromedical services in the world. It provides emergency and primary medical care to Australian residents regardless of race in the rural, remote, and regional areas of the country. Lunch was on our own in or around the local air-conditioned shopping center. Roger and I chose a small Thai restaurant that served sizeable, delicious portions. On our way back to the coach, we were embraced by an older Aborigine gentleman. We had been instructed by Ronan not to look at an Aborigine directly as a sign of respect. So we were shocked that he would grab us, hug us tightly, and say, “I love you,” several times. We could tell he was a little inebriated. The Telegraph Station was our next stop. Opened in 1872, the Station reduced the isolation of Australians. Previously the exchange of business and personal messages took months but the telegraph’s Morse Code reduced the time to hours. Photos and written displays at the Station told the story of the Lost Generation (AKA The Stolen Generation). European men deliberately impregnated Aborigine women, forcibly removed the mixed race children, and raised them in dormitories many, many miles from home to become servants for the European settlers in Australia. The children were beat if they spoke their home language or cried to go home. The government encouraged this method for the slow eradication of the Aboriginal race. A riveting movie, “The Rabbit Proof Fence,” depicts the true story of three of those children. The next day we rode the coach to an optional 4½ tour of the Desert Park. Because of a minor mobility issue, I opted to drive an electric cart at the park where we viewed a large aviary housing a variety of birds, thorny devils, and dingoes. We also saw an amazing Birds of Prey Show where the birds appeared and exited the arena on command. It was enlightening to hear the Aboriginal Survival in The Desert talk. The Aborigines knew how to live in the remote area, eating what grew in the wild and what plants could be used for medicinal purposes. After lunch on our own, our afternoon was spent at Kangaroo Sanctuary operated by Kangaroo Dundee (AKA Chris Barns). He rescues baby kangaroos or joeys from the pouches of their deceased mothers who were hit by cars. 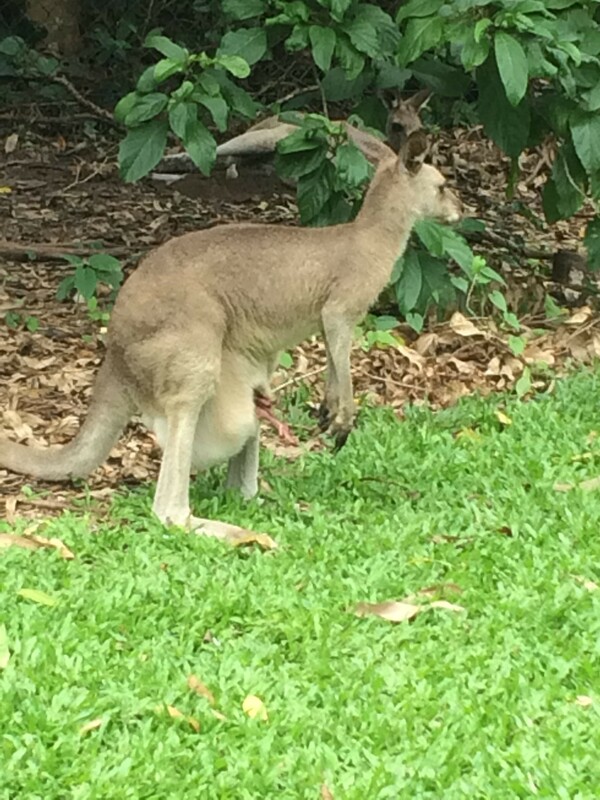 He carries the joeys 24/7 in a blanket pouch until they are mature enough to roam around on their own in an enclosed area. When they are able to fend for themselves they are returned to the wild. Each of us in the tour group took turns carrying one of two of the joeys as we walked the grounds to see kangaroos in the wild and a very aggressive one named Roger in an enclosure. He can’t be released in the wild because he’s too dangerous. Fighting kangaroos can disembowel a person with a single kick. On Monday, March 21, Roger and I rode side by side on camels guided around an enclosure by a camel trainer. Let me just say, Roger is a much better rider than I am. Afterward we stopped at a picnic area in the Outback for a friendly, family-style picnic with roast chicken, salad, rolls, other fixings and bottled soft drinks provided by Ronan. At 3:00 pm we finally arrived at the Ayers Rock Hotel and left by 4:00 pm on our way to The Olgas (or Kata Tjuta which means Many Heads) for a 50-minute site-seeing walk. This was followed by a sunset viewing of Uluru, the sacred Aboriginal name for Ayers Rock. The massive rock formation seemed to change colors as the sun set. We were served delicious hors d’oeuvres, fruit, and champagne. Roger and I and five members of our group joined other tour groups on Tuesday, March 22 to enjoy the beautiful sunrise over Uluru. After breakfast we took a couple of guided tours around parts of Uluru and visited the Uluru – Kata Tjuta – Cultural Center. After lunch we returned to the Ayers Rock Airport for a 2½ hour flight to Cairns to stay at the Double Tree by Hilton Hotel. Wednesday started with Hartley’s Crocodile Adventures. The guided walk revealed large crocodiles, wallaby feedings, and adorable koalas. Yes, we did get a taste of crocodile meat. Tastes a little like chicken, tough chicken. Afterward we stopped at an Aussie Pub to listen to the owner discuss his life in Australia and have lunch. This is when I tasted Australia’s famous ginger beer, a delicious, non-alcoholic soft drink. In the evening we stopped at the Wetherby Cattle Station (Aussie for ranch) to hear the owner lecture us about the cattle business. His wife treated our entire tour group to a delicious home-cooked chicken dinner. We returned to our hotel to rest in preparation for a trip to the Great Barrier Reef on Thursday. Your trip sounds wonderful! I have to put Uluru on my list of things to see. Sue, the trip was wonderful. If you get a chance to go, you won’t regret it. Glad to have read about your adventures. Looking foreword to someday getting together to see the pictures to go with the stories. Since this is a dream trip that I would love to do, you’ll never bore me with too many pictures! We’ll be happy to show you our pictures. We’re culling those that are not good enough to keep. Wish you the possibility of such a wonderful trip in the future. Barbara, I love seeing Australia through your experiences there. But you make me miss Steve Irwin, The Crocodile Hunter. He was an amazing guy. Thank you, Kelly. Yes, Steve Irwin, the Crocodile Hunter was amazing. Thank you, Jeanne, for following my blog. Wow! China. Roger traveled there many years ago and talked about going back. Thanks for thinking of us joining you two. We’ll consider it. Writing about our trip helps me appreciate the experience even more. Glad you’re enjoying the blog, Phil. Very interesting! I’ve learned a lot about Australia that I didn’t know. Well written article! Thank you, Claire. Our trip was an educational experience beyond my wildest expectations. Yes, the sunset at the Ayers Rock is the most fascinating thing to watch. Thank you, Kook-Wha. Ayers rock is a most fascinating thing to see at sunset and sunrise. Great, Barb. You and Roger are so lucky to have taken this trip. Can’t wait for the third installment!